Massive amounts of neighbors can make the progress in the game significantly easier. However adding thousands of other players can turn your facebook account into a big mess. This may be very annoying, especially if the player is using their real fb account for the game. Below you can find some tips on how to manage your neighbors and how to limit the visibility of Diggy's Adventure reward posts only to your gaming friends. 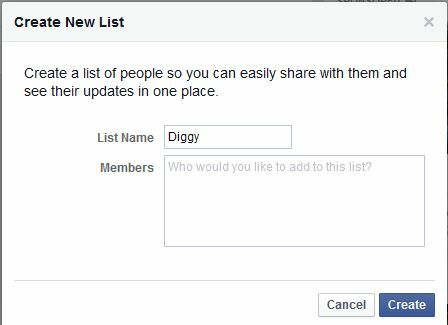 Important - You can also make a list for your real life friends, if you already have a lot of Diggy friends and it would take too long adding all of them there. This should work almost in the same way. 1. Find the option that says Friends in the left-side menu and click More. 3. In the pop-up, you have to choose a name for your list. You don't have to add any members right now, you can leave that for later. Click Create to finalize the process. There are multiple ways to add people to your newly created list. Start typing the name in the box, a drop-down menu will appear and you will be able to click on the name to add a person to the list. Below the box you can also see some suggestions. This will display the following pop-up window. Here you can switch between On this list and Friends. This allows easy adding of multiple people just by clicking on their avatars. A blue tick near on the person's profile picture means the person is already on the list. Whenever you send someone a friend request, you can quickly add themto the list from their timeline. To do this, hover your mouse over the Friends OR Friend Request Sent button (which means that you can add to your list people who are yet to accept your request). A drop-down menu will appear - choose the "Add to another list" option. Do this for everyone you send a request to/accept and they will be added to your list. 1. 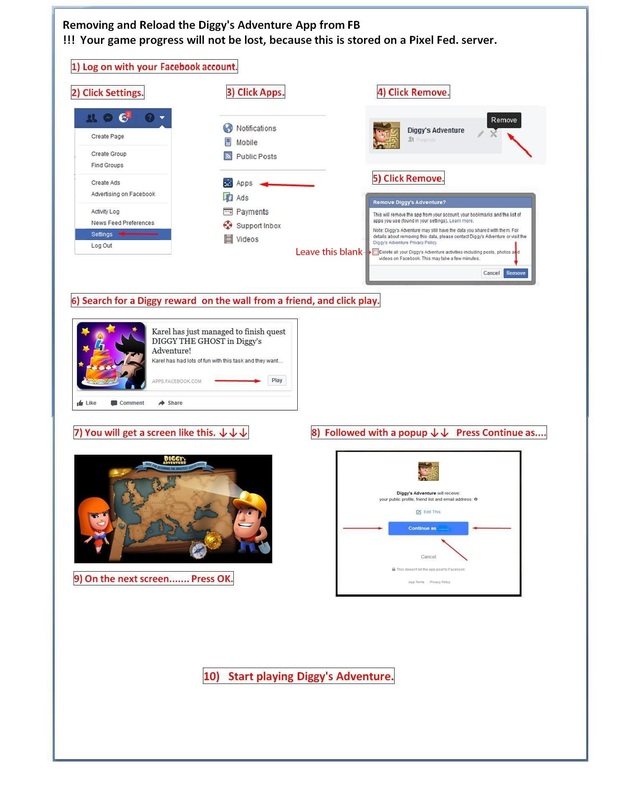 Find the Diggy's Adventure Application and open the settings (the same has to be done with Pixel Federation application, if the player shares rewards by playing on the portal). 2. In the pop-up window, near the App visibility and post audience open the drop-down menu and find your previously created list. 3. Done - now all your shared posts from the game will be only visible to your Diggy list. 2. In the new pop-up, find the text which says Don't share this with. Add the list containing your real life friends there. 3. From now on, the Diggy's Adventure posts will be shown to all your friends, except the people on the list called "Real Life". Q: Is it worth it? It will take a lot of time! A: The initial setup may take a couple hours, but later you will just add everyone to the list automatically without even noticing you are doing something. Your facebook will be orderly and your real life friends happy and not spammed with game posts. Q: Facebook has made a list for me! I am so happy! Yay! A: It's true that facebook sometimes makes a smartlist by itself. This is however not as great as it seems because of two main reasons. Firstly, not all your neighbors will get added to the list, which will make some of them lose your links and secondly, such list will try to force people to change their job to "Diggy's Adventure" by itself. This is frowned upon. Q: Do I need this kind of setup for the auto collectors to work? A: No you don't. 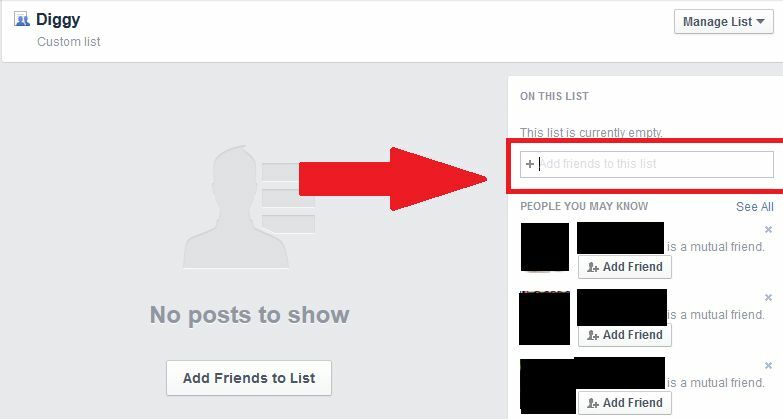 This is just a way of organizing your facebook so the mess is not that big and you are not annoying non-gaming friends with your posts. Q: Is there any other use for those lists other than sharing rewards from the game? A: Of course! You can post anything you wish on your timeline and set the visibility options for every post, similarly to how you did it for the game itself. Removing an inactive player is simply finding out who is inactive and unfriending them on Facebook. There are various reasons why players do this. Reached the Facebook limit of 5000 friends. Privacy for those players who do not have a Facebook "gaming account"
Various other reasons personal in nature. This is the easiest most common way to determine if a player is still playing the game. With the "send to all" option available on gifts every player should be sending to everyone on their list each time the log in to the game whether that be daily hourly or once a week. For a limited time this option will work. The kitchen was introduced to the game in the fall of 2015. If you were playing before the introduction of the kitchen but have not logged in since it was introduced you will have no kitchen in your camp and empty slots where your stoves were parked at. For players looking to remove these neighbors you can scroll through your neighbor bar one player at a time or just take note as you are collecting God's Children and remove those players as you can. Using the gifting system will negate the need to do this option. An extension for Chrome browser has been created and is currently available on the Chrome Web Store. It allows for instantaneous checking for inactive neighbors and easy removal of these neighbors. Facebook did an upgrade also in the fall of 2015 and you may not see game posts from players on their timeline anymore. You will still see them in your games feed (theirs and yours) but messy to try to navigate to find that one player you aren't sure is playing anymore. 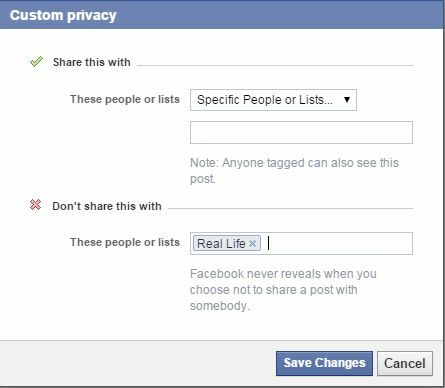 Secondly many players create a Facebook List (see above) and share their posts only with that list. You may want to message them let them know you aren't seeing their posts if this is true so they can add you to that list. After cleaning your neighbors and removing all those you deemed inactive, you need to log into the game on the portal using Facebook log-in button, regardless on which platform you play normally, if not more times to get them to fall off your neighbor bar. Sometimes there are a few stubborn ones and you can email support and ask them nicely if they can do a neighbor refresh for you. This should remove any unfriended players. There has been noted that even that does not take care of them all. That once in a while there will be one that hangs on with a death grip. If you are using the gifting system removal method you will probably get another refresh each time you clean. They will eventually fall off. Just consider that hanger on a bonus number in the GC neighbor visit formula. 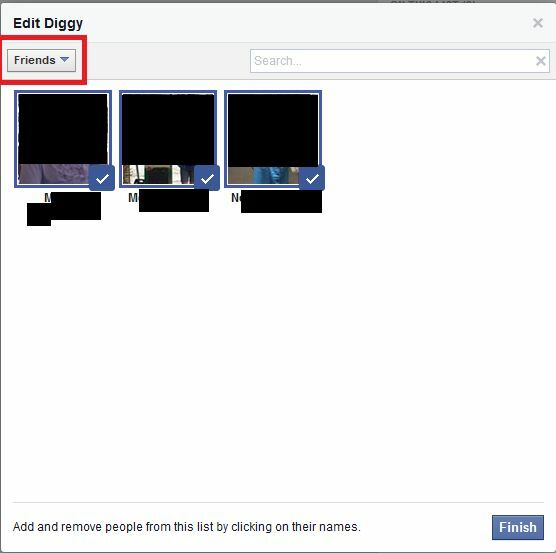 The list of friends in Diggy's Adventure can sometimes become de-synchronized with the list on Facebook so that some friends will show up in Diggy's Adventure that are not friends on Facebook, and some Facebook friends will not show up in Diggy's Adventure. The following picture shows the steps necessary to re-synchronize the lists so they are the same. This page was last modified on 10 April 2018, at 17:26.